In this collection of essays and speeches written over the course of four decades, beloved storyteller Natalie Babbitt explores what it was like to be a “little dog” in the literary world, continually being forced to justify her choice to write books for children --- instead of doing something more serious. Babbitt offers incisive commentary on classic children’s books as well as contemporary works, and reveals colorful insights into her own personal creative life. 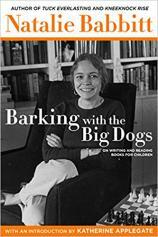 Filled with a voice that rings with truth, wisdom, and humor across the years, the essays gathered in BARKING WITH THE BIG DOGS exemplify on every page true reverence for children and an endless engagement with the challenge to write the books that shape them.